The Nanoha series began with Magical Girl Lyrical Nanoha where in Nanoha a young school girl helps a mage to collect ‘Jewel Seeds’ she then encounters an enemy who is also looking for the seeds, Fate, that series ends and Nanoha and Fate are friends. Magical Girl Lyrical Nanoha A’s takes place half a year after the first series wherein another magical girl Hayate is using an intelligent device the Book of Darkness to grant a wish, thus the Wolkenritter, Signum, Vita, Zafira and Shamal, appear to help Hayate fill the pages of the Book of Darkness, Nanoha and Fate then battle it out with the knights. After this series and around ten or so years later StrikerS kicks off with all the characters (Nanoha, Fate, Hayate & the Wolkenritter) and some new characters working in the Time-Space Administration Bureau. Subaru is one of the new characters introduced in StikerS. She is a cheerful and energetic person, however she somewhat timid and afraid of hurting others or being hurt. She looks up to Nanoha and wishes to be like her. During one of the episodes Subaru is revealed to actually be a cyborg. 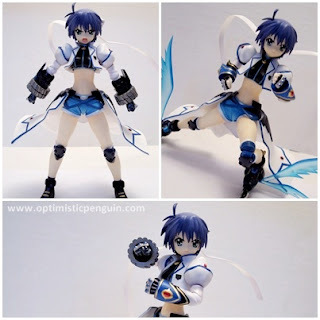 Subaru uses a form of magic called "Shooting Arts" which is hand to hand in style, her intelligent device Mach Caliber is a pair of rollerblades and she is able to use them in a number of ways, she also has a Right hand Revolver Knuckle which belonged to her mother, her sister Ginga posses the other. Subaru also can enter a combat cyborg mode, which enables her to use her full cyborg strength. Subaru comes in a standard Actsta box. 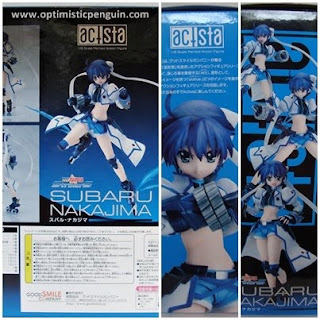 On the front is a window for viewing the figure, on one side is the Actsta logo with pictures of the figure, on the other is a picture of the figure with some details about the Actsta figure line, on the back there is relevant information, all in Japanese, and pictures of the figure in various poses with their various accessories. Instructions for swapping face pieces and other items are usually printed on either inside of the box tabs or on a piece of paper slipped inside the packaging. Also take note that all figures you purchase have the correct authentication printed or stickered on the box. Inside the box the figure is held between two pieces of moulded plastic, with spaces for their accessories and additional plastic moulding which fits behind the main piece holds the stand and the rest of the accessories. Figures are usually wrapped with plastic in certain areas to protect the paint. Boxes also come with inserts which act as backdrops in the box and can be taken out and used for backdrops while displaying figures. Subaru's backdrop is a reflective silver. Subaru comes with the standard Actsta stand. Made of clear plastic it has three points of articulation which move forwards and back on hinge joints, one joint is at the bottom where it plugs into the base, one in the middle and one where it plugs into the Actsta, there are also additional pieces for the stand, one bracket piece which plugs onto the end of the main stand and then there is a clip piece which plugs into the other end of the bracket piece, which allows even more dynamic display options, they even include a piece which hooks over the clip piece so that the clip joint will not scratch the figure. 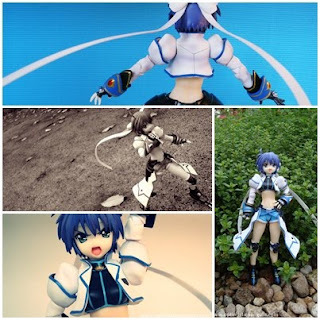 The articulation of the stand allows the Actsta to be posed in a variety of dynamic poses, and because it is clear it does not interfere with the aesthetic of taking dynamic and exciting photos. 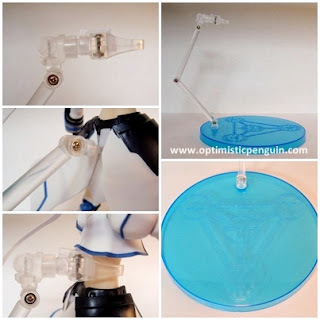 The base of the stand is a large circle and is made of semi-clear plastic the colour of which corresponds with the figure and also the corresponding magic symbol of the figure is etched into the base. This makes the stand personalised to the figure and is a very nice touch by Good SMILE Company x Liquid Stone. Subaru is the first figure in the brand new Actsa figure line, which is a combined effort of Good SMILE Company and Liquid Stone, and may I say they have done a great job. Subaru looks wonderful and is crafted beautifully. Subaru's overall design is that of a cool rollerblader, with short shorts and knee-pads, also her cyborg parts show through with her large Revolver Knuckle. She has nice curves and is just an all round pretty and pleasing figure to look at. Starting from the top, her hair is made of semi soft plastic to allow a little movement when posing while still maintaining her straight haired look. Her hair bows/ribbons a nicely done, and in a blown in the wind shape. One thing I noticed which is nice is that she has a piece of hair which is separate from her main hair, so that she can move her head up and down and side to side, while still having hair close to the back of her neck, a very ingenious design feature. Her jacket and sleeves are made of soft PVC and hide her joints very nicely. They are made of two separate pieces so that when moving her arm you can cover the joint nicely. She has two different sleeves one set with big cuffs which look great and another set which are her Revolver Knuckles, which are done very well. Her torso is done very well and she has a lovely shape to her tummy, and a very cute belly-button. Now her shorts are also done really well. The bent is made of soft PVC, and her shorts are soft PVC, making her shorts look very realistic, sitting on top of her legs, it also makes her leg movements look great as they move naturally with the figure. 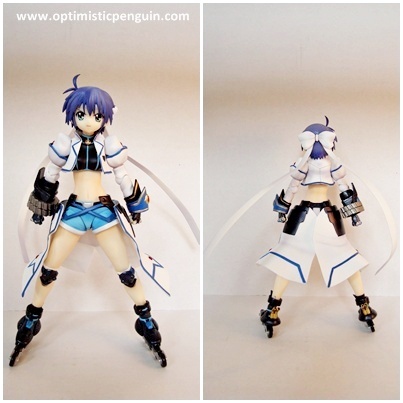 Her outer skirt is hard PVC but is given movement by joints. Her knee joints are hidden with her knee pads, and they are sculpted very nicely. 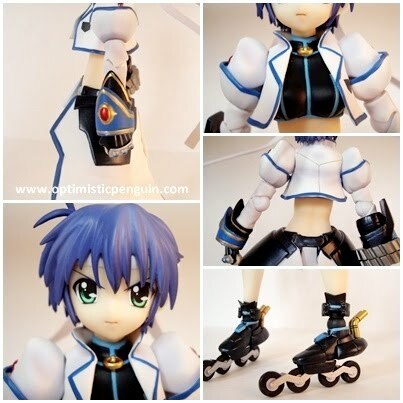 And her intelligent device, Mach Caliber, which is a pair of rollerblades look very cool indeed. Over all fantastic sculpt, and I really like the use of a lot of soft PVC makes the figure look more realistic. Subaru has a colour scheme of blue, white and black with some gold and red highlights. Subaru’s paint work is just amazing, however there are a few minor errors, but overall it’s just wow, really in a league of its own compared to Figma or Fraulein. Her colour scheme is wonderful bright and lovely, nice blue and gold and silver. Now onto why her paint job is so wonderful, well her clothing has lovely shading, and her skin is even shaded, her skin looks like that of a still 1/8 scale figure. Her hair is also very well shaded, most of her line detailing is neat, hardly any run overs. Her skates and knee pads have a nice metallic sheen to them. Over all she is just painted so well for an articulated figure. They really put a lot of effort into her, she just is lovely to look at. Subaru's accessories are all painted exceptionally well as she is, and her blue wings are even made so that the blue goes darker towards the tips, creates a wonderful effect. Both of her faces are painted and shaded great, her eyes look so wonderful. And all the detailing on her hands are done very well. Only a few minor complaints with the paint, one of her hair bows has glue residue on it which makes it look like the paint is messy, and the other place is she has some black on her ankle which has strayed from her boat, I may try and remove it myself at some point. But these are minor things and do not detract from her overall paint work. Subaru use’s the standard Actsta joint system. Actsta joints are ball joints with pegs on either end allowing both forward and back movement and rotation. At the head a Actsta joint is used at the top of the neck allowing the figure to look up and down and turn their head left and right, however looking up is restricted somewhat by the design of the back of the hair. 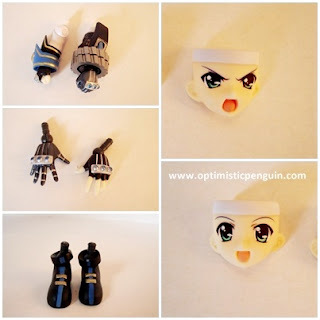 To change the faces on Actsta’s the front piece of hair is removed and then the faces can be taken of and swapped. 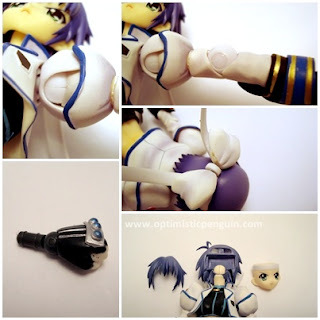 The shoulder consists of a double Actsta joint, one ball joint which sits inside the upper body, this is attached to a ball joint which acts as the shoulder, and this allows full range of motion to the shoulder. Further down another Acsta joint is used as the elbow and bends in and then out straight and there is some slight rotation for the lower arm to turn in and out. At the wrist the various hands plug into a small hole at the end of the arm. Each hand also has a small Actsta joint, which not only allows the hand to rotate but also to move up and down which gives the figure realistic wrist movement. An Actsta joint is then used as the knee allowing the knee to bend backwards and then out to straight, and there is some slight rotation for the lower leg to turn in and out. The ankle also is an Actsta joint allowing the foot to point and flex turn in and out. Subaru has six points of additional articulation, her hair bows are on pegs and can swivel and down, each side of her outer skirt has a joint allowing them to move around, her rollerblades also have joint allowing them to turn left and right so she can have some sliding action poses. 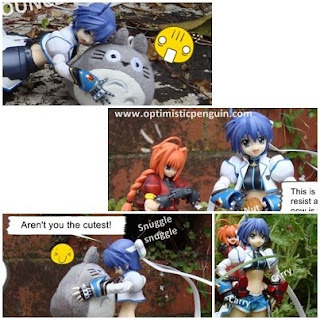 Subaru is therefore highly posable and can be posed in a variety of ways. With the use of the accessories supplied, her Revolver Knuckles and her Intelligent Device Mach Calibur, she can be displayed in a number of poses, zooming along with her Gear Excelion upgrade, ready for battle with both her Revolver Knuckles, and beside her best friend Teana. However there are a few areas in which articulation is restricted because the very back of her skirt is made on hard PVC so she can't put her leg back very far, but this a minor restriction. Subaru comes with three facial expressions; an angry yelling expression, a smiling happy expression, and a plain contemplative expression. Subaru also comes with an assortment of hands; two pairs of fists and a pair of open hands. Subaru also comes with her Intelligent Device Mach Caliber, which are her rollerblades and a pair of blue semi-clear wings which plug onto the bottom of them to simulate her Gear Excelion upgrade which allows her to move with extreme speed. To attach them just turn the joint on her rollerblades and plug them into the bottom. Subaru also has a pair of normal boots, two extra lower arms, one a normal sleeve and another Revolver Knuckle so that you can mix and match. Subaru is very compatible with other Actsta accessories, she can use Teana's hands and weapons and its most likely that she will be compatible with future releases. Next up is a height comparison, as you can see she is on the shorter side of the Acsta height scale, and Actsa's are in 1/8 scale and so tower over Figmas and Revoltechs. In general Subaru although having only a few accessories her amazing articulation makes up for this. You can get her into just about any pose and she will just stay there, she has great balance so posing with her is very easy. And although she is very large compared to Figma’s when her rollerblades are off she is only slightly taller than the Fraulein Revoltech line, and so will happily fit into the Café and my figure comics. She is a lot of fun, just to move all over the place, honestly her articulation is that good. Overall Subaru is a great figure and I recommend for anyone who wants to try out a new figure line. The first review I saw of ActSta Subaru her painting finish looked rather poor for GSC's usual excellence but yours looks better painted though. Look forward to see what the next ActSta will be like. Too bad she's so overpriced, she costs more than Alter's (larger) Subaru fixed figure.